WASHINGTON (CNS) — When St. Patrick’s Day falls on a Friday, as it does about every seven years, the Lenten rule requiring Catholics to abstain from meat on Fridays collides with the long-held tradition of eating corned beef and cabbage. The two occasions meet this year. March 17 marks the celebration of St. Patrick — known as the Apostle of Ireland for his years of missionary work there — and it also is a celebration of all things Irish and even green. This March 17, since it falls on a Friday in Lenten, also is a time of penitence. The timing has not gone unnoticed by some U.S. bishops. Before Lent even started, many of them issued dispensations for Catholics in their dioceses allowing them to eat meat on St. Patrick’s Day. The dispensation does not take Catholics totally off the hook. Many bishops advised Catholics over age 14, who are required to abstain from meat on Friday, to do an extra act of charity or penance in exchange for eating meat. As of Feb. 27, the following dioceses or archdioceses had announced giving the clear for Catholics to eat meat March 17: Baltimore; New York; Milwaukee; St. Paul and Minneapolis; Atlanta and Savannah, Georgia; Omaha, Nebraska; and Jefferson City, Missouri. The bishops primarily announced the one-day lifting of the church rule in statements posted on their diocesan websites. 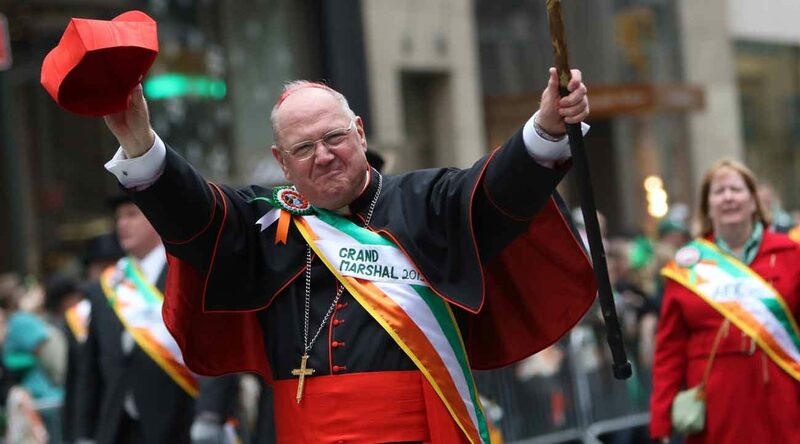 Omaha Archbishop George J. Lucas granted a dispensation from the meat observance but those who eat meat on St. Patrick’s Day must abstain the next day, March 18. New York Cardinal Timothy M. Dolan sent archdiocesan pastors a letter in late January notifying them of the dispensation and asking them to let their parishioners know about it. Milwaukee Archbishop Jerome E. Listecki noted that abstaining from meat on Fridays in Lent is an “important dimension of the penitential nature of the season,” but he said Catholics in the archdiocese that day would not be required to give up meat “given the many celebrations that occur on this day,” which in the archdiocese also includes the ordination of two auxiliary bishops that afternoon. Catholics in the Archdiocese of St. Paul and Minneapolis received a letter in late February from Susan Mulheron, chancellor of canonical affairs, saying the dispensation for St. Patrick’s Day had been issued by Archbishop Bernard A. Hebda after consulting archdiocesan leaders. Archbishop Hebda hinted he might grant the dispensation when he spoke at a Theology on Tap gathering Feb. 8 in St. Paul. When someone in the crowd asked him about the possibility of eating meat on St. Patrick’s Day, the archbishop asked for a show of hands of those who wanted to eat corned beef to honor St. Patrick. Contributing to this report was Maria Wiering in St. Paul, Minnesota. Follow Zimmermann on Twitter: @carolmaczim.